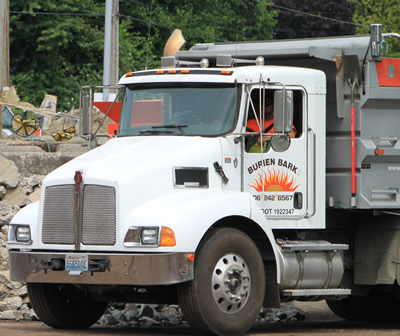 Burien Bark works hard to schedule on-time delivery of landscape materials to both residential and commercial customers throughout King County and the Seattle metro area. 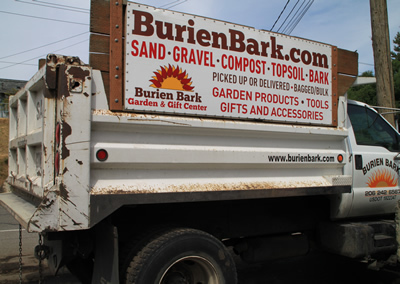 We deliver a wide selection of landscape materials including top soil, planting mixes, compost, gravel, bark, mulch, crushed rock, and sand. Our variety of truck sizes can accommodate any size load from 1 cubic yards up to 22 cubic yards. For your convenience, we have trucks with a divider capable of carrying two different products at the same time. With years of experience in residential and job site delivery in Seattle, our drivers will do their best to safely place landscape material in a one hour delivery window right where the customer desires. Typically this means the driveway, but we will be happy to place the material elsewhere, conditions permitting. Safe access for delivery is at the sole discretion of the driver. Free delivery of material for certain areas with a minimum quantity of 10 cubic yards. Call for pricing. Right sized trucks & loaders for every job! We have 5 dump trucks and 3 different sized loaders and trucks to fit every need. copyright © 2015 Burien Bark All rights reserved.